Hopefully it's still the weekend for most of you! I was a social butterfly this weekend...which is so unlike me. Usually I'm a vampire and I hang out in my room napping a lot since I'm always on my meds, so these past few days have been a welcome change! Saturday Andrew and I had a few friends over for a small BBQ. 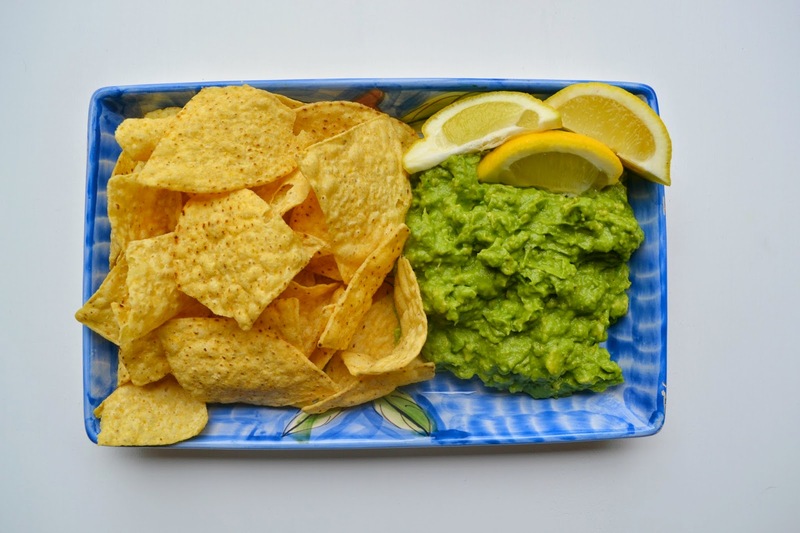 Here's the guac I made...because you can never have enough food pictures. Sunday morning our friends came over for breakfast. I don't get to see all my friends too often, but when I do I'm reminded of how lucky I am to have them. 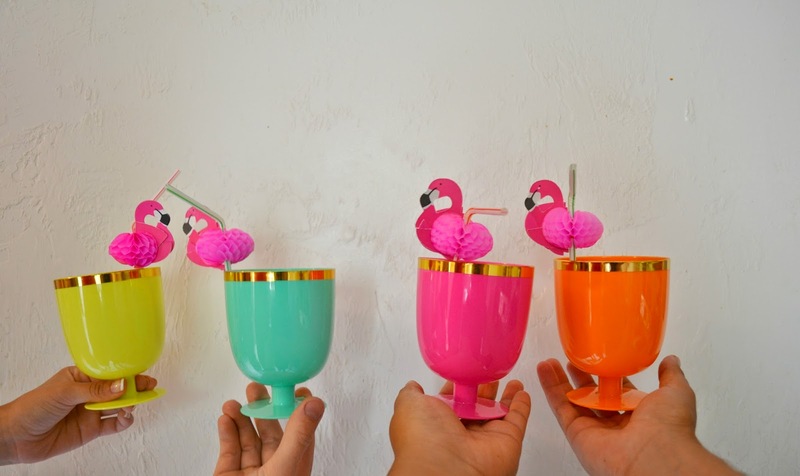 What friends get excited with you over Oh Joy for Target party cups and flamingo straws?? Mine do! On to goal setting...It's going to be a really busy work week, but we've got some fun things planned to break up our days and I am so excited! 1. Post my about me and my button...So, so. My about me is up finally! Now you can know who I am! 2. Laundry. Negative. I think I might have to hire someone to start doing this treacherous chore for me. Just kidding! Sort of. 3. Clean my car out. Nope. I'm starting to think it will always be messy, and I'm somehow okay with that haha. 4. Get more sleep. YES! Sleeping early (ish) makes such a difference! 5. Have a BBQ. YES! It was small, but the food was delicious and the company was great! 6. Start doing a bible study. So, so. As I mentioned, my readings are so sporadic and I'd like to make it a daily activity. 7. Take a million pictures of anything and everything. Nope. 1. Eat better/drink more water. I'm going wedding dress shopping in ONE MONTH! It's crunch time guys! 2. Take our engagement photos. This is more me telling you we're taking them haha. We're going to Disneyland tomorrow to get them taken and I am SO excited!! 3. Donate my clothes. I'm in the middle of taking even MORE clothes out of my closet. I'm really looking to simplify as much as possible. 4. Read my bible every day. It's necessary. 5. Clean my car out (for real). 6. Contact someone in regards to food for our engagement party. Andrew is really insisting we have a taco person come. I have to confess that even though I am full on Mexican, I am not a big fan of tacos. I know, I knoooow. I'm the worst! Two things before I go...in case you missed the announcement earlier, you can buy tickets for our next Bloggers Giving Back event here! It's going to be really fun and you definitely don't want to miss it! Second, thank you to our service men and women who have given their lives to our country in order to keep everyone else safe and happy. Today is 100% all about you! Sorry for the late response! I'm also super into reading about other peoples wedding things actually! It feels crazy to be planning my own now haha. love the cups!!! Good luck with your wishes this week! Hope you have fun at Disneyland getting your pictures done!! Laundry is always on my list, the worst part is after you do it - you have about 10 days before it gets back on there! I totally agree that laundry is a never ending item on a to do list! The worst! !